The publisher of the Thoroughbred Daily News (TDN), Sue Finley, has been a friend of mine for over three decades. When we began talking about her desire to add video content to their existing daily newspaper, monthly lifestyles magazine and podcast, we weren’t thinking of working together on it. Our strategic talks were about her building something consistent and affordable while maintaining the TDN’s high standards for their professional, horse-savvy audience. 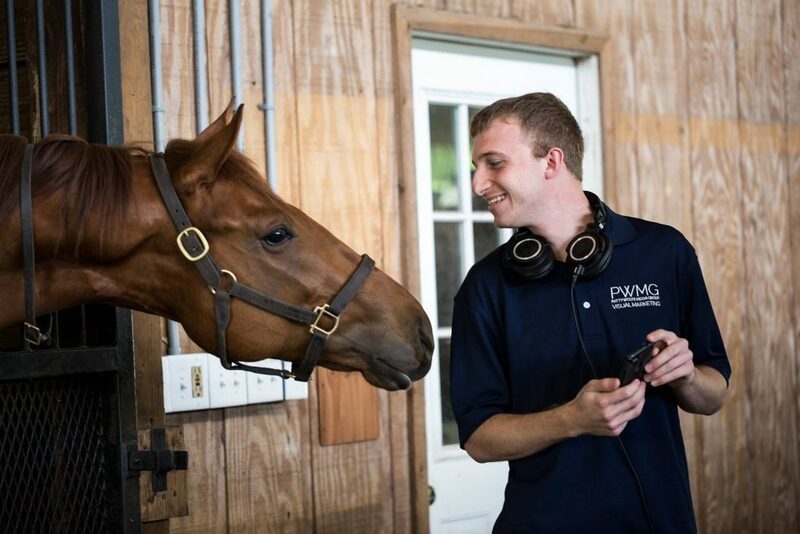 It happened that we (PWMG) were out producing features for NYRA (New York Racing Association), and we offered to shoot some quick soundbites for the TDN. Sue became more and more interested in what we were doing for NYRA, where she had held her first job in the industry 30 years earlier, and began giving us our best feature ideas and support. And we were having fun. We decided then that we should work together to flesh out the TDN video model. We agreed that the best plan would be to involve the TDN writers who are already covering the stories on the grounds at sales and major races. The TDN audience knows and trusts the writers. So, we started shooting interviews and features with writers conducting the interviews and assisting in the formatting of the pieces. The first roll out of videos were well received but it soon became clear that we could not keep up with consistency needed for a good build out without spreading out. With my crew stationed here in Florida, we could only cover so much without exhausting the budget Sue was targeting. We started distributing cameras to Sue’s staff. First up was Alayna Cullen in Ireland. Alayna filed stories immediately. She was slightly apprehensive about her video skills at first, but determination was on her side. Alayna now files beautifully shot interviews, b-roll and stand-up reports. She has developed several video series already and TDN Europe will never be the same. Kelsey Riley, in Lexington, took to the camera almost immediately as well. Kelsey rode the Mongol Derby last August (620 miles across Mongolia on a horse). She was not going to let a camera, a mic or a gimbal scare her. Lucas Marquart, a popular thoroughbred writer and experienced shooter, was a natural. Christie DeBernardis was also an early joiner and, in conjunction with PWMG, earned herself an Eclipse Award for her feature on Zenyatta’s first foal, Cozmic One. This was a big moment for the TDN as the Eclipse Award is the most prestigious in Thoroughbred racing. We now have a team of writers working on both written and video stories. They shoot and upload their footage to cloud folders, where we retrieve them. Together with the writer, we format the feature and then edit it for publication. Anthony LaRocca heads our team in video production and asset library storage. I suspect his brain operates like AI (my nickname for him along with Ant Farm) because the amount of new material he can process is uncanny. If you need a specific horse clip, Anthony can find it before you begin to count seconds. We are now producing an average of four videos a week for the TDN and continue to grow that number. The TDN team is growing in numbers and production skills as well. We were helped in planning our video processes by a friend of mine at ABC News who has to file stories rapidly with deadlines looming. Years back when Sue and I worked at ABC Sports we had to churn out multiple pieces and sometimes worked multiple shows in a week. So, we are a company today that works on quality in conjunction with efficiency and productivity. After the video content was established, several of Sue’s advertisers inquired about doing features on horses that would be coming up in future sales. Sue conceptualized doing sponsored advertorials to inform her readership as well as help her sponsors drive sales. It is Content Marketing 101 taken to a new level. 201? These are fleshed out stories. Comprehensive. Informative. And journalistically sound. They are marked as sponsored by the advertisers but produced by us and the TDN writing staff. For people looking to spend millions of dollars buying horses, the more information the better. As well have rolled out the advertorials we have been astonished by the numbers. In every case, the advertorials beat out the straight commercial ads by multiples of view numbers. The potential buyers appreciate the added information and the sellers enjoy the spread we are seeing with these videos. Sue can explain how far and wide they travel and how they have been received in the Thoroughbred marketplace. Working with the TDN on this project has been exceptionally gratifying. Growing something out of a solid journalistic foundation is the best of all circumstances. We started with the notion that it is far easier for a writer to become a producer than the other way around. Story telling lies at the base of all forms of journalism and now we are learning that it is the most effective marketing tool as well. We are forever grateful to our partners at TDN. Content media is a team sport, and we love our team.